The secret of the Law of Attraction is the key to manifesting money, love, and anything your heart desires. Yet, the secret to success with the Law of Attraction is left out by most Law of Attraction teachers. To understand the secret of the Law of Attraction, you need to understand the difference between mind energy and heart energy. You see, you are a magnet. …your positive thoughts and your negative thoughts. Your thoughts form the words that you speak…giving your words the power to create. Controlling your thoughts uses mind energy to create. Removing limiting beliefs uses mind energy to create. Reprogramming your subconscious uses mind energy to create. And while this produces results for a little while, you are missing the key to making the Law of Attraction work effortlessly…every time. When you use mind energy to create with the Law of Attraction, you’re doing all the work yourself. You don’t want to try to do this on your own. It’s too hard, takes too long and doesn’t always work. You want to use the energy of the Universe. And you do that with heart energy. Heart energy is the secret of the Law of Attraction. 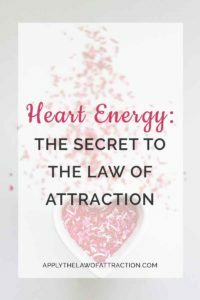 So how do you use heart energy with the Law of Attraction? Heart energy gives your thoughts the energy to come to life. And the most powerful heart energy that exists is love. Wrap every thought you have in love. Feel yourself surrounded by love. Feel love for everyone and everything. Now, this will take practice…but as in all things, practice leads to mastery. At first, you might have to set aside five minutes here and there throughout your day to tap into your heart energy. But in time…maybe a few days…or a few weeks…it will be second nature. Your heart energy will grow so strong that you will radiate love without trying. You’ll have mastered the secret of the Law of Attraction. Who Can Use Heart Energy? I just had an a-ha moment reading this! It makes perfect sense! Whenever I’ve used “heart energy” my manifestations have always been rapid. I’m going to have to think about this some more. A lightbulb is still going off! Aren’t lightbulb moments wonderful? I’m glad we were able to help trigger one for you. It really is amazing what a difference knowing how to use heart energy makes. Most Law of Attraction teachings focus only on the mind. We’re really trying to focus on teaching people to use more than their mind. Real success is when the heart is used too. You’re right that heart energy speeds manifesting up a lot. Let us know if your lightbulb causes any more dots to connect. My brother recommended I would possibly like this web site. He was totally right. This actually made my day. You can’t imagine how much time I had spent looking for this info! Thank you! Hi Maria, I’m so glad you like the site and it had the information you were looking for! Hello. Is heart energy the same thing as feeling love, joy, gratitude etc on the emotional scale? Hi Tiffany – Heart energy goes beyond the emotional scale. While it has similarities to the feeling of love, it’s an energy radiating from your body that you can expand or retract at will. I already mentioned this in another post of yours. I can’t believe I have been using this technique unknowingly. I appreciate you writing this article. When you start doing this and you wrap your thoughts in love is that what ends up creating the feeling and such? Wrapping your thoughts in love is just one part, and is separate from the feeling of being surrounded by love and radiating love. I am writing simply to compliment your work. I have been studying, exploring and using the law of attraction for about a year now and I have to say that you possibly possesses the deepest understanding of it out of everyone whose works I’ve read. Yesterday, I finished reading your book and have only amazing things to say about it. You have been brave enough to explore the law of attraction beyond what everyone else has told you about it and you have deepened the general understanding of it, which is truly inspiring. Thank you and keep up the amazing work! Thanks so much Nina! Your comments mean a lot to me! Elizabeth would you agree that it is state of being that determines your reality more so than thoughts? If I have “good” thoughts or what you would consider thoughts that were in alignment with what I wanted but my state of being was one of resistance or incongruity with those thoughts I have no likelihood of manifesting or creating what I desire. Would you agree? I can notice when I have thoughts in alignment with what I want sometimes I get a feeling of resistance in the sense that I can recognize the lack of those things or a feeling of anxiety. So I find that if I am having good thoughts they don’t help most of the time because of that until I get in the right state of being first then have those thoughts. By the way I like your website very much. It’s concise and to the point and addresses all the major issues or concerns people have about the LOA. You should definitely do a podcast or something like that to amplify the effect of the information you are providing. Thanks! Am I understanding this correctly… If you really tune into heart energy, your resistance and limited beliefs will naturally dissolve? thank you for everything you wrote about the Law of Attraction! I can’t find the right words to express how grateful I am because with your articles I suddenly felt “in the right way” – happy, excited, doubtless. You helped me realize that whenever I felt the unlimited love it helped me to succeed in what I wanted. Thank you for everything! I send you my love and wish you all the best in your life. I am grateful to the Universe for showing me the way to your website! Thank you Branka! I’m glad my site has helped you so much!